Georgetown University offers a limited amount of parking for visitors and employees. The university strongly discourages visitors and employees from parking on the street and encourages alternate forms of travel. Click here for detailed directions to Georgetown from various points in the region, including all three major airports. This page includes information for visitors and members of the Georgetown University community about driving and parking on campus. Southwest Garage (Use 3611 Canal Road as the address for directions using GPS). This is the garage for university visitors. Medstar Georgetown University Hospital administers these other parking lots on campus. For more information on these facilities please call (202) 444-3802. Parking for all university visitors is available in the Southwest Garage, accessible via Canal Road NW. This garage is cash only. Visitors should use 3611 Canal Road NW as the address when mapping directions using GPS. Click here for detailed driving directions to campus. Visitors with valid handicap permits may park in designated parking spaces in the Southwest Garage after paying the posted parking rate. Yates members are allowed to park for free in Southwest Garage before 9:00 a.m. and after 4:00 p.m. Monday through Friday with a valid Yates parking pass. Parking between 9:00 am and 4:00 p.m. is permitted for a fee of $5/hour with a maximum of two hours per visit. Student and Faculty/Staff who are members must comply with University parking policies; Yates cannot distribute parking passes to these members. Note: Employees can sign up for either parking or Smart Benefits, but not both. Satellite parking (Rosslyn) – No new parkers accepted. This document provides steps departments should follow to request visitor parking. Law Center faculty and staff who have a valid GULC parking permit may park in the Southwest Garage free of charge when visiting the Main Campus. Hangtag permits are issued and renewed annually by OTM. All Georgetown employees must pay for parking through payroll deduction. The permit should be placed on the rear view mirror, on the driver’s side dashboard, or the inside the driver’s side rear window. For permit holders with two registered vehicles, only one vehicle may be brought on campus at any time. On occasions when both cars must be on campus simultaneously, one car must pay the hourly or daily parking fee. If a second car is found to be on campus unauthorized, the car will be cited and booted. Multiple infractions may result in withdrawal of parking privileges on campus. OTM will post instructions when the online registration renewal process opens. If your car is sold, traded, or wrecked, please notify OTM and provide updated vehicle information. Parking permits are not transferrable from one vehicle to a new vehicle. If you lose a permit, there is a replacement fee of $100. If the permit has been stolen, you should file a report with the Georgetown University Police Department or the police district in which the crime took place. The $100 fee will be waived if you provide a copy of the incident report to OTM. Individuals who have an on-campus parking permit who wish to switch their lot assignment may put their name on a wait list at the OTM office. These lists are reviewed regularly, but it is not possible to predict when a space will become available in the requested lot or garage. Key cards are issued by OTM for individuals who park in Lots 6 and 9 and require a deposit of $25 by the employee, $20 of which will be refunded if the card is returned when parking is no longer required. Lost or stolen keycards will be deactivated and replaced for a non-refundable fee of $35. Lot E, Leavey P2/P3, Garage 4 and Southwest Garage parkers may access the garage using their GOCard. The University strongly encourages Georgetown faculty and staff to form carpools, which save money, reduce pollution and congestion, and reduce stress.University parkers who form carpools are will be given priority if spaces are available and receive significant discounts on parking rates. All members of the carpool must be Georgetown faculty or staff and current parkers to receive this benefit. Individuals who ride motorcycles to work will be guaranteed an on-campus parking space in designated motorcycle parking areas. A decal will be issued for motorcycles, but the decal is not transferrable to an automobile. Motorcycles may not park in spaces designed for full-sized vehicles or in bicycle parking areas. Faculty and staff with a valid annual decal and state-issued disability permit who require disability parking spaces may request assignment in specific parking lot by contacting OTM. To request any other accommodation, please contact the Office of Institutional Equity, Diversity and Affirmative Action. (1) A vehicle parked, left, or stored without the consent of the property owner shall be removed immediately after a notice of infraction is issued and conspicuously placed on the vehicle. EV charging is available on a first-come-first-served basis in the Southwest Parking Garage and Garage 4 (under Hariri). 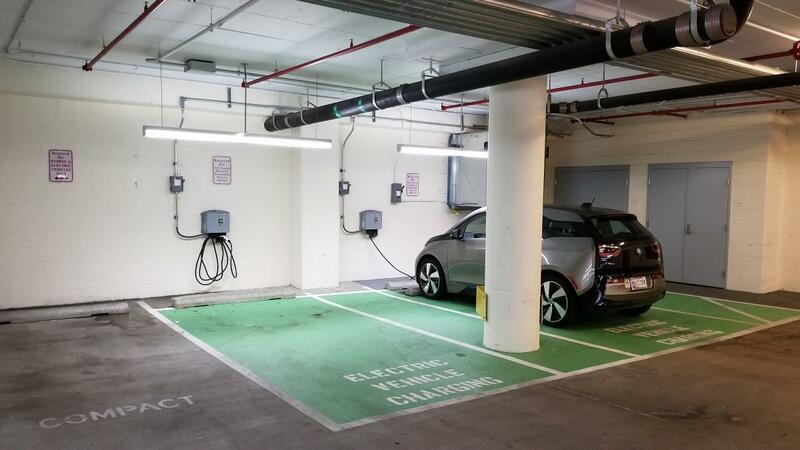 There are four Level 2 EV chargers on the P3 level of the SW Garage, and two Level 2 EV chargers on the P2 level of Garage 4. The chargers are currently free to use by employees and visitors who are authorized to park in these garages. The spaces are reserved for active EV charging only, so we ask users to be considerate of other EV drivers and move their cars to a different parking spot once charging is complete. Georgetown University does not provide on-campus parking for undergraduate students. With very few exceptions, undergraduate students are prohibited from parking motor vehicles on campus and/or on residential streets in Georgetown, Burleith, and Foxhall. This is a violation of the Code of Student Conduct. Students with disabilities who require parking can contact the Academic Resource Center to make alternative arrangements. A limited number of spaces are available for commuter students at a satellite lot in Rosslyn, VA. Assignment will be decided by lottery at the beginning of the fall semester. Students residing in the District of Columbia or in Virginia in zip codes 22201, 22203 (east of Glebe Road), 22207 (east of Glebe Road-Lorcum Lane-Military Road boundary), 22209, 22210, and 22216 are not eligible for a parking permit. Applications for the lottery may be obtained from the Office of Transportation Management (OTM. Please contact OTM by email at otm@georgetown.edu or by phone at (202) 687-4372 for current rates. Current University students (with valid ID), including evening and continuing education students, and students attending local colleges and universities that are members of the Consortium of Universities, may park in Southwest Garage after 5:00 p.m. for a fee of $5.00 (cash or GOCard). Cars must be moved out of the garage by 6 a.m. the following morning. The following is an abbreviated version of the Georgetown University Traffic Rules and Regulations. Further questions may be directed to the Office of Transportation Management at otm@georgetown.edu or 202-687-4372. It is the driver’s responsibility to find a legal, marked parking space and to park the entire vehicle within the space boundary lines. Citations issued by OTM or GUPD must be paid within 10 days of issue. Citations can be paid online (beginning September) or by mail or in person at the Office of Transportation Management, Mezzanine Level, Kennedy Hall, Box 1108, Georgetown University, Washington, DC 20057-1108. Payment may be made using cash, check, Visa or Mastercard. Motorist assistance provides emergency vehicle service to those in need and is available from 6 a.m. to 10 p.m. Monday through Friday (except university holidays) in the Main Campus parking areas. This includes battery jump-starts, flat tire assistance, key retrieval from locked cars and related assistance. There is no charge for these services; however, you must sign a service request form that releases the university from liability.